here's my entry for the autumn society's upcoming east meets east show at AxD. the show is a visual exploration of japanese pop culture's effect on american pop culture. 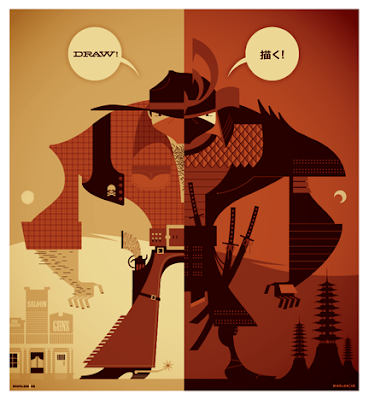 my original pieces, (oh-so cleverly titled "cowboy" and "samurai") will be available as individually framed, very limited (only 2 each!) 10" x 20" prints. i'll be attending wizard world philly all day on friday, but i'm going to try to stop by the gallery for the opening...hope to see you there! Really drawing my interested given how much I've been playing video games western Red Dead Redemption recently. Nice work! I seriously can't own these? That breaks my heart. This is too brilliant to limit to only two each.